Several years later I’m sitting in an R-rated movie that I’ve snuck into with two of my nerdy best friends, David Gregg and Mike. We sit transfixed, staring into the endless void of black as the heavy, buttery popcorn scent fills the air. In the background, the rhythm of brisk staccato drumming swirls around us as the title The Hunger flies out from the darkness and floats on the screen. Soon we are entranced by the appearance of an unearthly, ghostly thin singer encased in a wire cage. We hear the feedback of an electric guitar, swirling and distorted as it moves within the mix, creating an eerie landscape reminiscent of that sound effects record from years before. The specter poses in time, peering at us intensely as we glimpse fragments of an audience watching from the smoky darkness of a club. I have also become part of the audience, transported from the movie theater in Texas to a foreign land where we are frozen by these exotic sounds and images. A simple bass line is added and the tension swells while the dancer continues his hypnotic, angular movements. Suddenly another guitar strums into the mix, rising in volume as the figure begins to growl his mesmerizingly haunted song. As the film ends we watch the credits to make note of the band: Bauhaus. They were unlike anything we had ever known – the ghostly singer clinging to the cage, pale and unnaturally thin, revealed our own reflections as we sat awed in silence; our brains instantly rewired. It wasn’t just the music or the imagery, but the combination of both which stirred our cavernous hunger for something that could never be satiated. This was different from the usual bands we were seeing on MTV, who were mostly a flashy variant of the standard top 40 and album rock we had grown up with. This was during the time when we would watch MTV endlessly, hoping to glimpse anything unusual and mind-expanding, but inevitably turning it off hours later, exhausted and disappointed. One song by Bauhaus had changed everything. We desperately hoped that the band was real and not just some studio fabrication to fill in the opening scene with one great song on a soundtrack. In our dreams they had a cache of albums waiting to be discovered, and the songs would adhere to something equally impressive – not just a one-off of greatness. 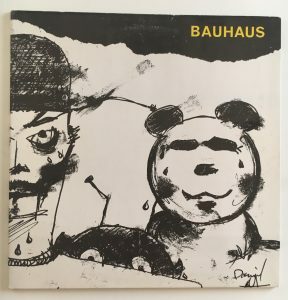 Although we enjoyed seeing David Bowie projected 20 feet high as an aging vampire, Bauhaus inspired something greater, leading us onto the path of a lifelong adventure. A group of friends from Northampton, England had unknowingly crossed the Atlantic and journeyed across the Bible Belt into Pasadena Texas, guiding three bespectacled, pale boys on the possibility of a different life. The next day, David pulled out the Yellow Pages, phoning record stores to find any information on the band. Not surprisingly, the few record stores in Pasadena were confused, but we finally struck gold when we discovered The Record Exchange, located in the Montrose section of Houston. The employee on the phone apathetically deadpanned that we were searching for the live album, Press the Eject and Give Me the Tape, which they had in stock. David, Mike and I quickly negotiated with David’s dad to borrow his hideous beast of a truck that we dubbed “The Behemoth,” and after checking the map we traced the vein from the blue collar suburbia of Pasadena to the vibrant heart of Houston. Walking into the record store that day was our equivalent of hurtling through the unknown reaches of space to a new planet and emerging from the landing module to see the thrilling vista of an alien terrain. A landscape of exotic sounds lay waiting for us to explore and raise a flag to stake our claim. These albums were thrilling for someone raised with the paltry selection of the prosaic record section at the Foley’s department store back in Pasadena. This vibrant Montrose area of Houston, known informally as the “gay arts district,” eventually became our sanctuary. We had discovered a new world with an environment more ideally suited for the growth of our nerdy species than the Southern Baptist confines of our home planet. I stare at the wet paint as it drips down the half-finished Swamp Thing mural, pondering my urge to paint it. Foremost it looked spectacular and would be fun to paint, but I also related to the monster’s life in the humid swamp. In spite of the relative blandness of my suburban landscape in Pasadena, we were located at the edge of Armand Bayou, which was teeming with alligators, armadillos, water moccasins and other swampy life. I’d see signs of that life as I tooled along after my dad while he golfed at a course located along the edge of the bayou. This often included vibrantly colorful plants, poisonous snakes huddled in the rough and huge gators audaciously basking in the sun along the fairways – reveling in their prehistoric reptilian glory. In classic monster sense, and in spite of his earnest efforts, Swamp Thing is a misunderstood and frustrated monster. It was a human who has transformed into something unknown and repulsive to society. This echoes the anxieties of teenagers struggling to be understood while undergoing the monstrous metamorphosis of puberty. The monster was a perfect entity to project my feelings onto – torn between a longing for acceptance, while craving the first taste of freedom. 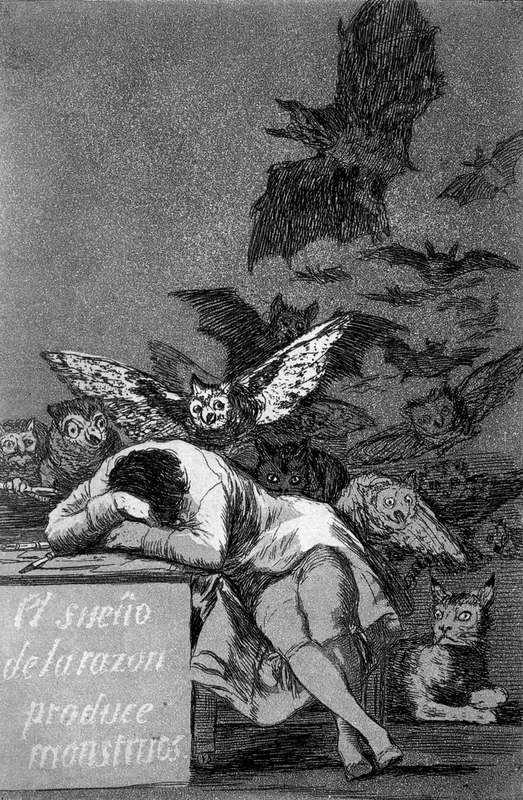 Monster stories existed long before the legendary Grendel tore through the mead-hall, but it is argued that the monsters popular from each era are based on cultural fears. They often serve as a reflection and commentary of their own time. 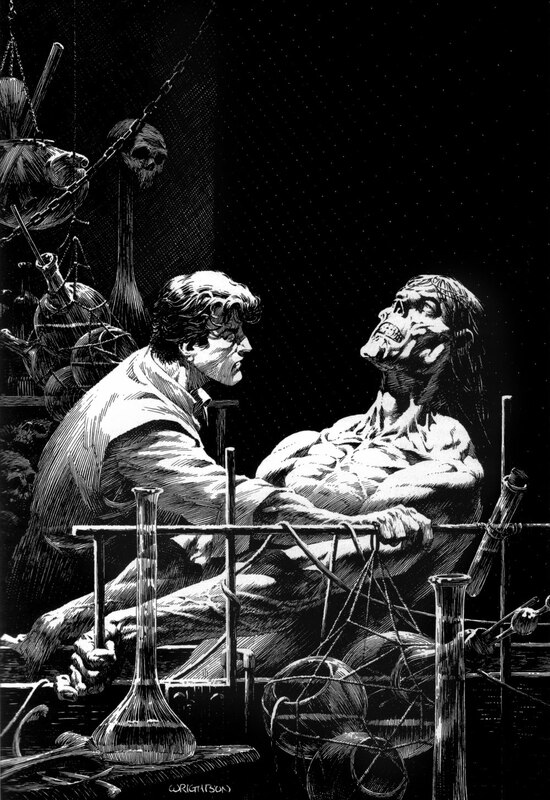 Frankenstein’s monster became one of the first well-known literary monsters, as Mary Godwin Shelley patched together elements from popular culture, contemporary science and her personal anxieties to assemble the creature. 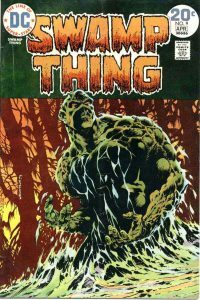 Swamp Thing is a descendant of Frankenstein, and although different in origin he is also searching for an answer. 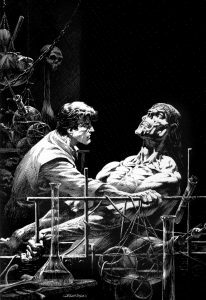 It is no coincidence that the artist Bernie Wrightson co-created Swamp Thing shortly before publishing his phenomenal illustrations based on Shelley’s Frankenstein. 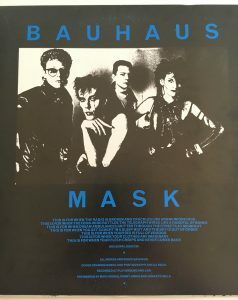 The fateful day that my friends and I walked into Record Exchange, David bought the Bauhaus album we were searching for, while I chose another album by them called Mask. I was thrilled to discover that the record store would write a small description or review for new albums on a tag, which they would display with the stacks of vinyl. The visit provided an opening into progressive music, giving us something to research and anticipate buying on return visits. As we crawled back into the truck and carefully peeled open our records with skills honed over years of gently handling comic books, we were thrilled to see that David’s had an extra 45 single included, as a well as a poster collaged from images of the band in concert. This was the first we had seen of the other band members, all as creepily fascinating as the singer Peter Murphy had been in the film. Mask opened into a gatefold featuring a photo of the band and a fascinatingly cryptic poem by someone named Brilburn Logue. The drive home was filled with frustrated excitement and salivating hunger in anticipation of returning to my climate-controlled, pristinely wallpapered and carpeted bedroom to devour these unfamiliar sounds. David dropped me off in front of the house, our young oak tree in the yard exposed and barren against the brutal Texas sun. I pad through the house. I close my hollow bedroom door. I open the lid on the turntable. I tenderly remove the slab of vinyl. I slide it onto the spindle. I place my index finger on the runout. I push the record to spin. I take my dust cleaner and sweep it across the endless void of black. I touch the power button. I lift the tone arm – trying not to shake from excitement. 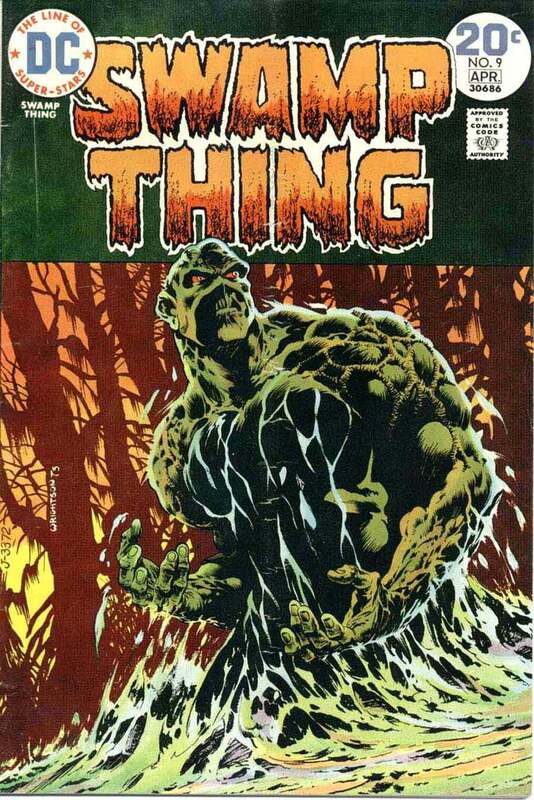 The following year I bought a new issue of Swamp Thing at Ultimate Dreams, our beloved local comic book store. The series had just signed the hotshot British writer Alan Moore, who was leading the comic into a less-traditional and more metaphysical direction. After reading a few issues, I was captivated by this mysterious and darkly introspective version of the monster. Soon I began collecting anything written by Alan Moore. Standing in front of the mural, I remind myself of my good fortune in that for a year I have attended weekly painting classes at our local craft store, The Bee Hive. Every Thursday I would hone my skills depicting mostly bland landscapes, portraits and animals. Thanks to this painting experience, I was confident that I could quickly paint something monstrous for the haunted house – we only needed to block out the image and shadows, then build up the light areas on top. I had never painted anything so exciting or large – I even needed a ladder to reach the top! Working on this mural temporarily fed my ambitions. I was raised with a hunger to make things – the lingering promise of potential. Only 20 years later during my art career in New York would I begin to feel that I had initially tapped into this urge. I assume most creative people feel this same drive. My favorite tiger painting from age 12. Soon after discovering Bauhaus, we heard the tragic news that the band had already broken up. Our life-changing band had ended before we first heard them. At the time, it was difficult to receive news about such bands outside of record stores and gossip among friends. Thanks to the information on the tagging system at Record Exchange, we began listening to the new projects made by the various ex-members. Peter Murphy, the lead singer, would go on to forge an impressive solo career influenced by the instruments and rhythms of Eastern regions. But it was the various projects created by the remaining three members, particularly Tones on Tail and Love and Rockets, which would affect me the most. 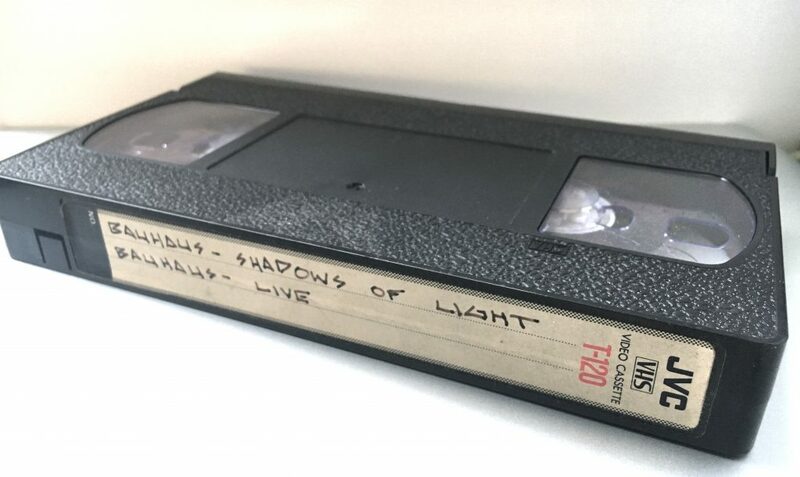 My well-loved Bauhaus VHS tape. In 1985 we began to hear “Ball of Confusion” played at Numbers, a new song by Love and Rockets, who named themselves after the brilliant comic book. I eventually discovered that the single was a cover version of a 1970 song by the Temptations. Soon enough, I was enamored by Love and Rockets, buying anything I could find at Record Exchange as soon as it was released. After graduation in 1985, I began taking classes at San Jacinto Junior College because that was all that was offered. My parents knew that if I went away somewhere, it would be even worse. My depression would overwhelm me at a traditional dorm-based university, which they couldn’t afford anyway. During my senior year, I half-heartedly studied for my SAT and ACT tests, but backed out of taking them at the last minute. I never applied to any college, nor did I know what I wanted. The easy entry into “San Jac” was my only option. During my senior year and for several years after, I shared wonderful adventures with a close group of friends, yet I still felt disconnected from life around me. This dislocation was compounded by putting my foot down with my parents during my senior year and finally abandoning the Baptist church. As much as they were distraught by this decision, I knew that it was leading to a slow death – forcing me into a corner that offered no room for either growth or my imagination. The resulting existential emptiness only added to my profound melancholy. There were often days when I would easily sleep for 16 hours, then roam the house in an aimless cloud before hopelessly returning to bed. It was during this time that I told my mom that I wanted to seek mental health care for depression. Unsure of how to proceed, she avoided the topic. I’m sure she sought an answer through prayer, which would have consoled her, but offered me nothing. Years later I told my therapist in New York this story to which he responded, “Maybe it’s for the best that she did nothing. Can you imagine what type of therapy you would have received in Pasadena, Texas? Odds are that it would have made you worse.” More recently I was surprised when my mom brought up that conversation, telling me that she had always felt guilty about it, but had no answer, knew nothing about therapy and had nowhere to turn. My problem had shut her down as well. This is a difference between my parents and me. Whereas they tend to hunker down, looking inward to survive, I have grown up to be a man of action, refusing to be a passive observer. These are years when I was directionless, struggling with depression and looking for myself. I was unenthusiastically attending classes at San Jacinto, searching for something to guide me while feeling powerless and only looking forward to adventures with my friends and weekly trips to the comic book store. As an adult driving through small towns, I often imagine myself in the shoes of lost teenagers searching for an escape. At least I had Houston within arm’s reach, which included a scene comprised of other disaffected teens, as well as local thrift stores, a decent library and close friends. I always console myself with the hope that modern kids have access to the internet, providing a connection and inspiration beyond the reaches of town. When the first Love and Rockets album arrived, Seventh Dream of Teenage Heaven, I recorded it onto a Memorex cassette, carefully labeling the front and back complete with the icon of the heart and rocket. I’d close my bedroom door, turn off the lights and lay in bed with my headphones on, turning up the music loud to drift in the melancholy space of the whispered lyrics and echoed instrumentation. This was the perfect album to bond with after high school graduation, pondering what my private future would be as the songs embraced a supreme melancholy, loss of faith and a search for direction in the aimlessness of life. By this time, I was fully immersed into the new wave scene, identifying strongly with its characteristic melancholy lyrics, swirling wall of guitar, and booming drums. Love and Rockets were unlike Bauhaus in their prime, with a more produced pop sound now that the Iggy-esque physicality of Peter Murphy was no longer a prowling frontman. 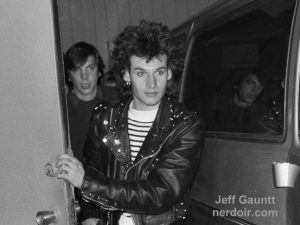 It seems appropriate that Love and Rockets didn’t attempt to replace him with another dynamic lead singer, instead having David J and Daniel Ash share the vocal duties, often harmonizing while Kevin Haskins pounded away on the loud, echoed drums. Only now do I realize that the lack of a defined lead singer creates an emptiness inherent to their music, the void of a defined frontman adding to the atmospheric longing in their sound. The following year I saw that Love and Rockets were touring for their second album, Express, which continued along the same lines as the first album. The free Montrose paper had an ad for a show at a small seated theater near the old Sears building. By that time my friend David Gregg was working at Texas Tapes and Records in Pasadena, which had recently become a Ticketmaster outlet. He was happy to buy tickets as soon as they went on sale, shocking me and Mike with front row seats. During one my endless sleep sessions leading up to the concert, I had a dream of meeting the members of the band. They were easy-going and quiet, often referencing inside jokes and laughing together as we casually discussed art and philosophy. 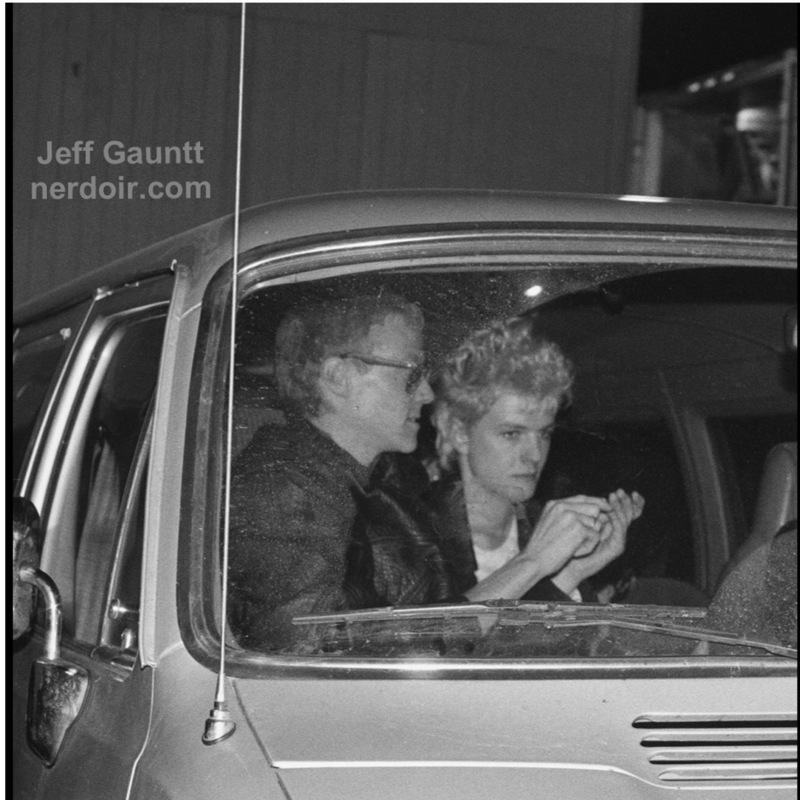 On December 9, 1986, my heart ached with excitement as Mike and I made our way into the small, decrepit Maceba Theater, which was lined in red velvet like a rotting slice of frosted birthday cake. We shuffled down the aisle, saying hello to a few acquaintances from the scene before finding our seats at the center of the front row. Soon after the opening band The Bolshoi left the stage, the curtains closed while we waited. Finally, the lights dimmed and we stood transfixed, staring into the endless void of the red velvet curtain as the unmistakable scent of a fog machine filled the air. In the background the rhythm of drumming swirls around us as the velvet curtains part, fog pours out from the darkness and I feel my spirit lift, soaring away my body, which is covered in chills. Spotlights close in and I see the band enshrouded in fog as their churning, propulsive cover of Syd Barrett’s “Lucifer Sam” roars to life. I was finally part of the actual audience, transported from the solitude of a movie theater where a kid watched The Hunger, consumed by the sound and vision of a band projected in light upon a screen, to a foreign theater across Houston, suspended in time and space by the physical force of these sounds. For the following hour I float, experiencing the soundtrack of my life written and performed by three Englishmen I have little in common with. After the encore, the curtain reopened and the band’s alter-egos, the Bubblemen, appeared together on stage. Wearing wonderfully clumsy costumes reminiscent of Daniel Ash’s cartoony cover drawing for Mask, the band “performed” the Bubblemen Song. They wobbled through a synchronized dance while waving to the audience and lifted the finale into reaffirming smiles. Then suddenly it was over. Afterwards, Mike and I followed the band’s van to the Holiday Inn around the corner and managed to snag an autograph from Daniel Ash and Kevin Haskins as they waited in the lobby for the elevator. It concluded my perfect night in which my musical heroes traveled from their homeland and performed at a venue located just blocks away from a store that had played a vital role in guiding me through their music and the soundtrack of my teen years. 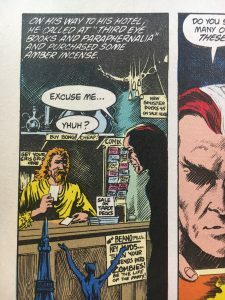 Panel from Alan Moore’s Swamp Thing, with a Sinister Ducks promo in background. 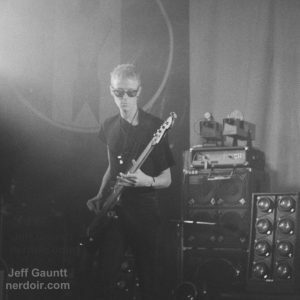 I saw Love & Rockets play again the following year on November 28, 1987, although this time they performed at Numbers nightclub, where I smuggled in my Canon 35mm camera. Once again the show was emotionally uplifting and beautiful, completed with an appearance by The Bubblemen. 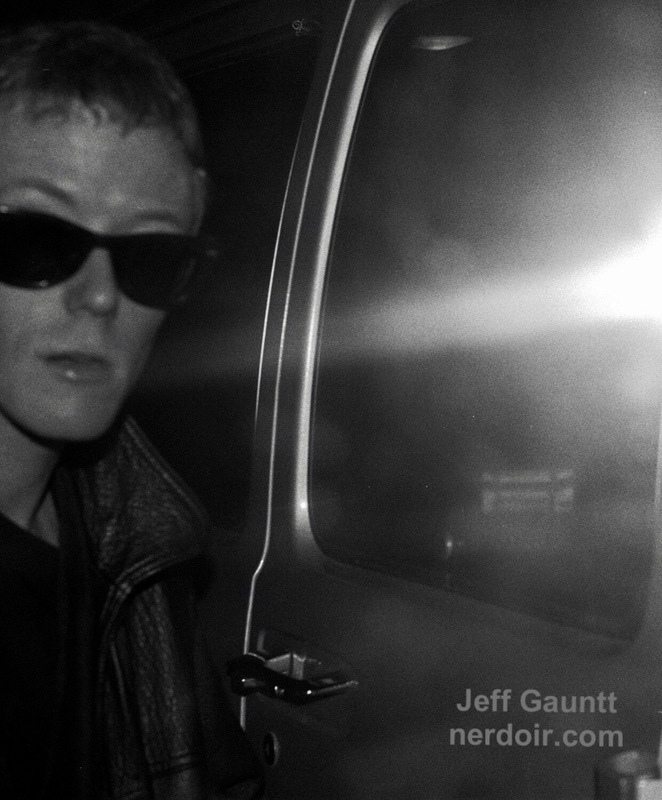 After the concert I rushed behind the club clutching my Love and Rockets record, hoping to have it signed. The band kept to themselves, darting into a van parked just outside the back door, while a few assistants shuttled their belongings. 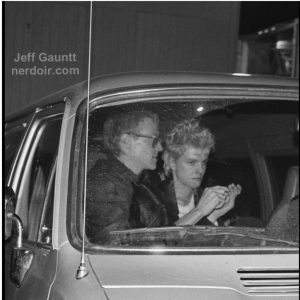 The guitarist Daniel Ash patiently waited in the backseat keeping to himself. 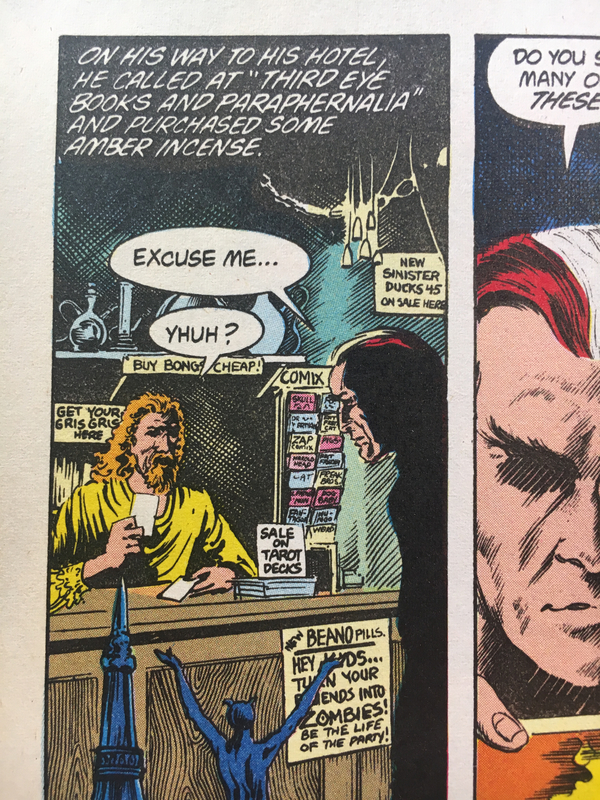 I saw that he was reading a comic book, and even from my distance I was thrilled to recognize that it was The Watchmen, written by their friend Alan Moore, aka Brilburn Logue. My Swamp Thing circle was suddenly complete. As David J and Kevin Haskins scrambled in, I stood with the crowd and snapped a few photos. Just as the doors were shutting, I yelled, “Say hello to Alan Moore!” Daniel Ash and David J looked up to meet my glance and smiled before the doors slapped shut and the van disappeared into the darkness of the Montrose neighborhood. I stand transfixed, staring into the endless dripping muck of Swamp Thing looming over me as the heavy, plastic scent of wet latex paint fills the air. In the background, the murky waters are ripe with vines clinging and foliage straining around his limbs as the silhouette of a plaintive dog howls in the distance, encased by the moon. Someone in the haunted house flips on black lights as the monstrous greens, purples and blues bound to life. I proudly imagine myself as Victor Frankenstein assembling his wonderful creature, but this is different – I used paint to form this monster. David Johnson stands beside me, beaming smiles at each other through the alien light. Every creator does the same thing – building little beasts in our studios, but once they escape the safe confines of home we lose control, reluctantly allowing them to roam freely and find a life (or death) on their own. Little did I realize that painting this mural would connect to other significant events in my life – all forming a path through the swampy landscape of my Texas childhood. That one day I would be standing behind a club after a concert in the depths of Houston and snapping photos of a band who were friends with the same writer who’d take over Swamp Thing before going on to change comics with his innovative writing. Soon after moving to Los Angeles in 2008, I discovered Amoeba Music, the largest remaining record store in the area. One Sunday after browsing through the bins, I walked outside and saw a pale, thin figure in sunglasses coming towards me along the sidewalk. My heart jumped as we grew closer before I simply said, “David J, I love you.” He stopped, a bit afraid of what he’d be confronted with as he lifted up his sunglasses. He seemed relieved after he glanced me over, and then replied with his dry English accent, “Darling, I love you too,” before walking away. I’d like to thank Johne Boylan at Roots of the Swamp Thing, for inspiring me to write this piece. He kindly approached me last year, asking if I’d be interested in contributing something to his zine. I immediately decided to write a story about painting the mural, but I didn’t anticipate the Bauhaus connection or that I would take me one year to finish. I highly recommend his wonderful site and Instagram page. 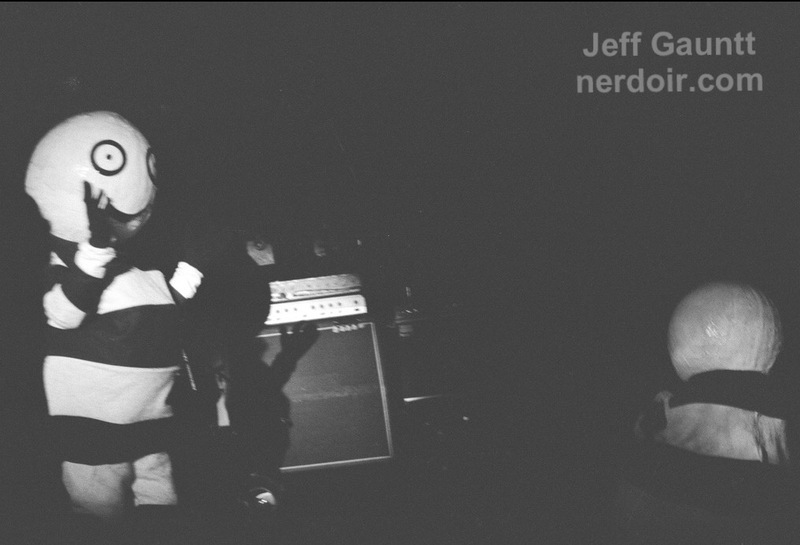 I plan to open my Nerdoir site for writing submissions. I would enjoy sharing other personal stories about growing up and feeling outcast from the norm. These can be funny, dramatic, or tragic, but it is vital that they are told with an honest sensitivity. They can take place in any era, and they do not need to be “genre” related for them to be nerdy. This was a fantastic read. Coming from Texas and having very similar experiences with Love and Rockets, the church (christian counselling), and art influences it’s especially touching. I love that David J told you that he loved you too *darling*. Thanks for your nice Texas reply. Christian counseling sounds like the worst thing I can imagine. If you feel like sharing any story about your experiences, I’m going to soon open up the blog for personal nerdy stories from contributors. I’d love to hear more. Wow! I am gleefully shocked to hear from you. Yes, that was me! 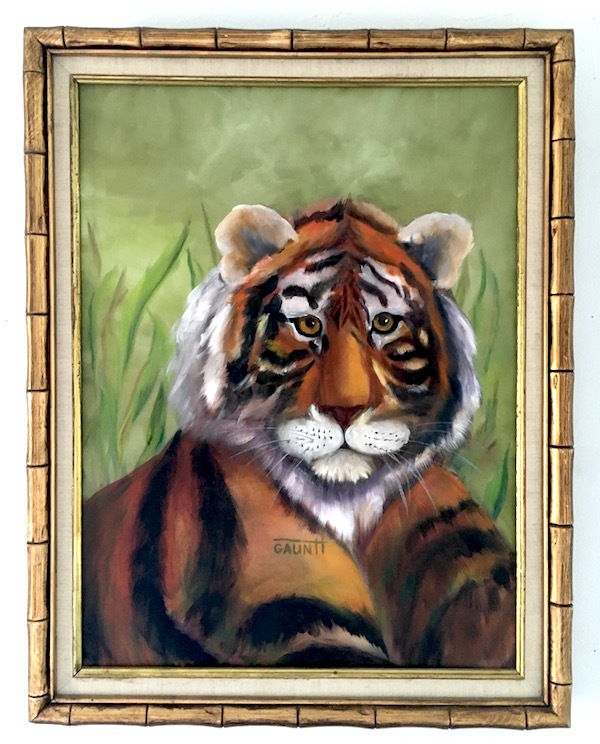 I no longer had your name, and although I vaguely remember what the painting looked like, I have no photos of it or the sign, so I’d love to see them. Thank you for your kind response. Please email me directly at mynerdoir@gmail.com. I’d love to get any picture you could provide!